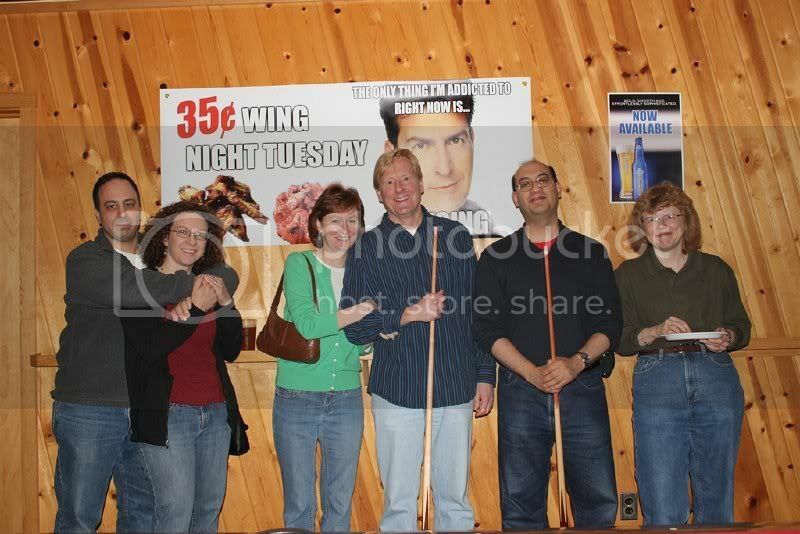 A few weeks ago, between Free Comic Book Day and seeing The Avengers, Janice and I went to Lanes & Games in Cambridge, Massachusetts, for fellow blogger and former co-worker Ken G.‘s annual Cinco de Mayo party. We met other IDG/CW alumni Michele L.D. and Bob R. and their respective spouses Paul D. and Sheila K.R. Just a month before, I had dinner with Ken, Michele, and Bob at the Met Bar & Grill in the Natick Mall for “The Escapists” book club. We discussed Michael Chabon’s Pulitzer Prize winner, The Amazing Adventures of Kavalier and Clay, which we mostly enjoyed. As a longtime comic book fan and onetime New Yorker, I found the novel very evocative. We played a few rounds of billiards/pool as munchies and Ken’s other friends arrived, including a few I remembered from previous shindigs. None of the friends I’ve introduced Ken to made it. 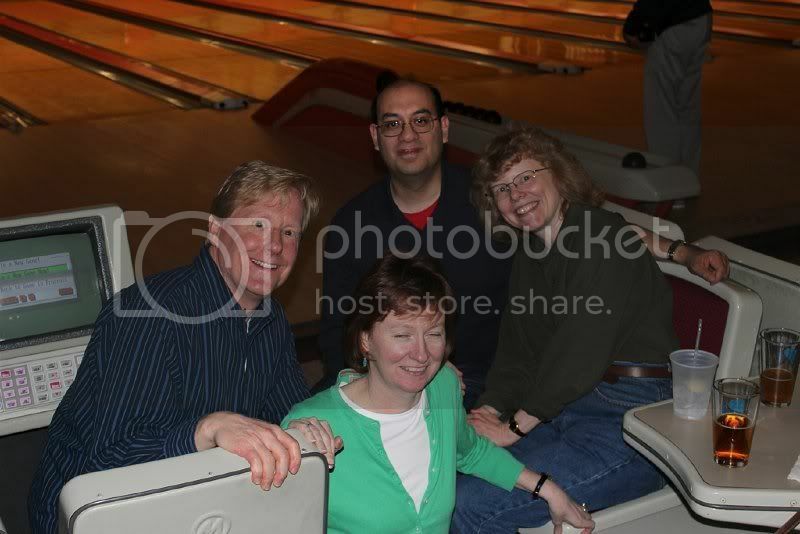 We then tried candlepin bowling, which both Bob and Ken were good at. 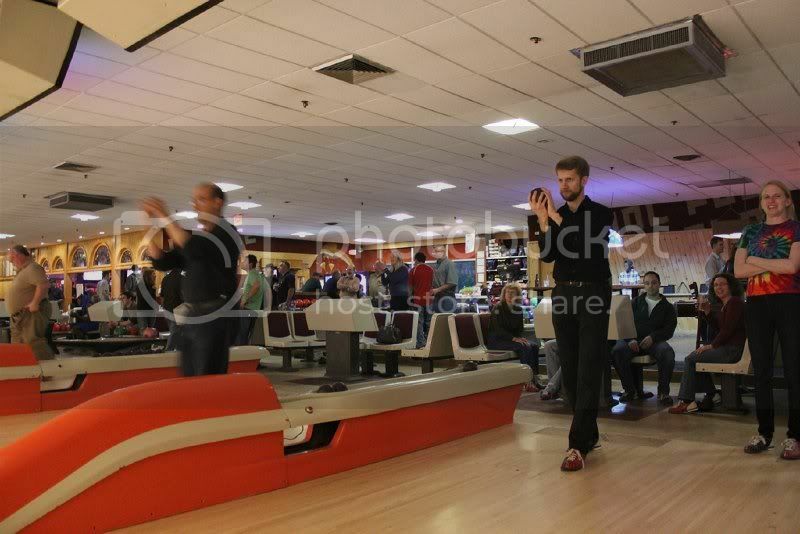 I lobbed gutter ball after gutter ball (I’m not as bad with regular bowling or its Wii equivalent). Janice’s game improved significantly, though. 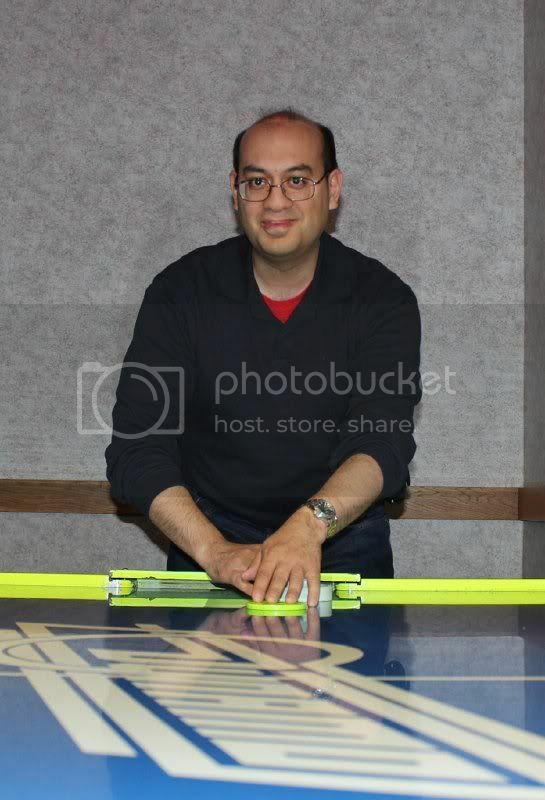 I did slightly better with air hockey, which I won a tournament in back in the early 1990s in Queens, New York. Overall, we had a good time, and it was nice to have an excuse to socialize. I get along well with most of my current co-workers, but the copy desk crew had a decade for its chemistry to develop. In other games, my role-playing groups are in transition. On Monday nights, I have been running my “Vortex” space opera for two face-to-face teams of about six people each, using FATE 3e Starblazer Adventures/Mindjammer and Bulldogs. I haven’t heard from Team 2 (the grifters on the Appomattox) since my recent move from Needham to Waltham, Mass. I know those guys are busy with other things, including Greg D.C.’s FATE 3e Dresden Files modern supernatural game. “Vortex” Team 1 (the explorers aboard the Blackbird, for which I owe an update) has chosen to take a break for Jason E.R.‘s “Glassworks” superhero miniseries. The fictional city of Hamilton, Delaware, is the same setting that Jason ran with his DarkPages noir one-shot, but we’ll be using the Marvel Heroic Roleplaying system. So far, these Cortex-based rules have gotten mixed reviews (I do like the Leverage adaptation). Marvel Heroic Roleplaying‘s dice-pool mechanic reminds some of us of the “FASERIP” Marvel Super Heroes, and its Power Points are similar to FATE, but the core book’s organization could be better. A good alternative might be D20/OGL Mutants & Masterminds 3rd Ed./DC Adventures or Icons. I trust that Jason will come up with interesting scenarios for our street-level vigilantes. On the weeks when Jason isn’t running, we’re looking at various ideas, including Bruce K.’s Pathfinder: “Conan” and Rich C.G.’s fantasy and horror proposals. Brian W. has graciously offered to host the Monday games. I don’t mind the break from Game Mastering, but I’m sure I’ll want to be back behind the screen soon enough. On Sunday nights, my “Vanished Lands: the Uncommon Companions” fantasy campaign (using Pathfinder, Skype, and an online dice roller) is again on hiatus because of scheduling conflicts for half of that teleconferencing group. So in the meantime, Josh C. has been running his “Spelljammer: the Show Must Go On” space fantasy miniseries (using FATE 3e Legends of Anglerre and Google+/Tabletop Forge). Last for now, but not least, my historical weapons class at Guard Up! in Burlington, Mass., has continued to be interesting. Each Wednesday night, I and about 10 other students spend half an hour practicing our moves with wooden or resin weapons and half an hour sparring with foam ones. It’s good exercise. Our instructor, Karl, has shown us the basics of the quarterstaff, longsword, and warhammer. We’re currently learning about the naginata (a Japanese pole arm) and will eventually get to the great sword and fencing. Posted on May 16, 2012 by GeneD5Posted in Comic books & superheroes, Fantasy & Steampunk, Food, Games, Reading & Writing, Speculative Fiction, Vanished Lands, VortexTagged fate, party, RPGs, sfrpgs, weapon.